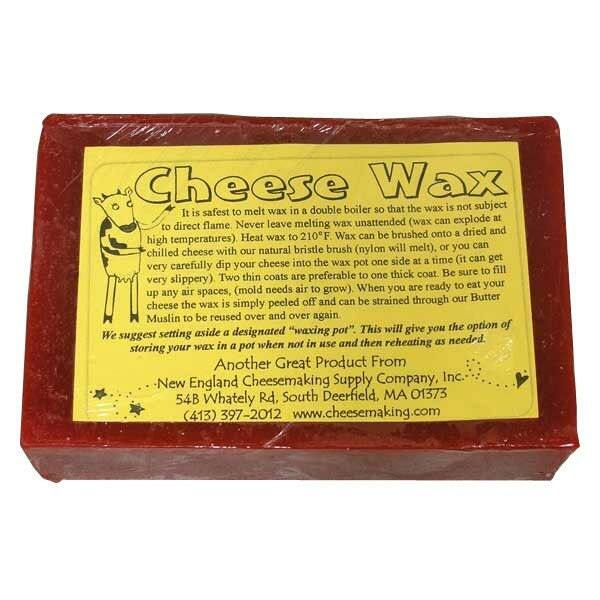 Cheese Wax is especially made for coating cheeses. It helps prevent unwanted mold growth while retaining moisture in the aging cheese. This wax is pliable and will not become brittle as will pure paraffin wax. Dosage: One pound will wax approximately 12-20 cheeses when brushed on. Directions: It is safest to melt wax in a double boiler so that it is not subject to direct flame. NEVER leave melting wax unattended. Wax can explode at high temperatures. Heat wax to 120ºF. Wax can be brushed onto a dried and chilled cheese with a natural bristle brush (anything synthetic will melt), or you can very carefully dip your cheese into the wax pot one side at a time (it can get very slippery). Two thin coats are preferable to one thick coat. Be sure to fill up any air spaces as mold needs air to grow.